Well, after whats been a pretty rubbish week, this arrived and has cheered me right up! 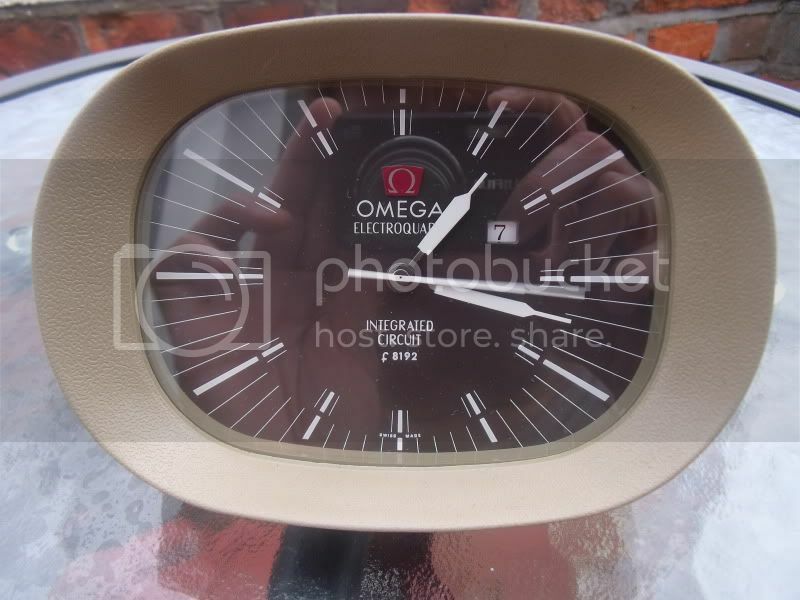 Introduced in 1968 these where basically the predecessors to Omegas quartz revolution of the 1970's, they were produced in very limited numbers and from what I can gather weren't commercially available, virtually all of them where sent to large Omega retailers and display clocks or given as gifts by Omega. I bought this one from a chap in France, it is only the third one I have ever seen and the only black dial version, the only other one I have seen in the flesh is owned by Swiss Time Services and resides in their museum display. Everything about the clock smacks of hand made limited run manufacture, even down to the glass which when dismantled is noticeably hand finished on the edges to fit the case, the case is hard plastic with a steel inner shell/ hub for the workings to be mounted on all of the workings are encased in a large plasic pod like rear shell, very cool! It weights about a kilo and is very marmite, I personally love the design, my wife thinks it looks 'cheap' sigh! Anyway thought I would show it off, not something you will see everday and certainly not something i'm likley to find for sale again anytime soon! It is a very impressive piece of kit, the images really don't do the movement justice, what amazes me though is that one year later this technology was in a wrist watch! The quartz on it is huge and the circuit board is just a work of art, really just amazing, whats more amazing is that even unserviced (which is not something I think even STS would want to try) it is absolutely bang on time! I like it. Well done. That is very cool indeed. Really like the design and very nice to have a little date on it too. Would love one on my desk. Excellent find (as usual), well done Tom. Is this a similar to the one that Keith had a while back? I liked that one too. I know JonW had a similar but brightly coloured Tissot (from memory) desk clock too, which I came very close to buying. Jon's was a Derby Swissonic, very cool design though and so of its time. Wondered when another one of these would surface....trust me to have my back turned. Especially as I lost the last one when a fellow collector sniped me after agreeing not to bid. Ah well...suppose it serves me right for selling mine to TC at STS. Thats the last couple to come out of France ..isn't it ? PS Hang onto to it this time eh! 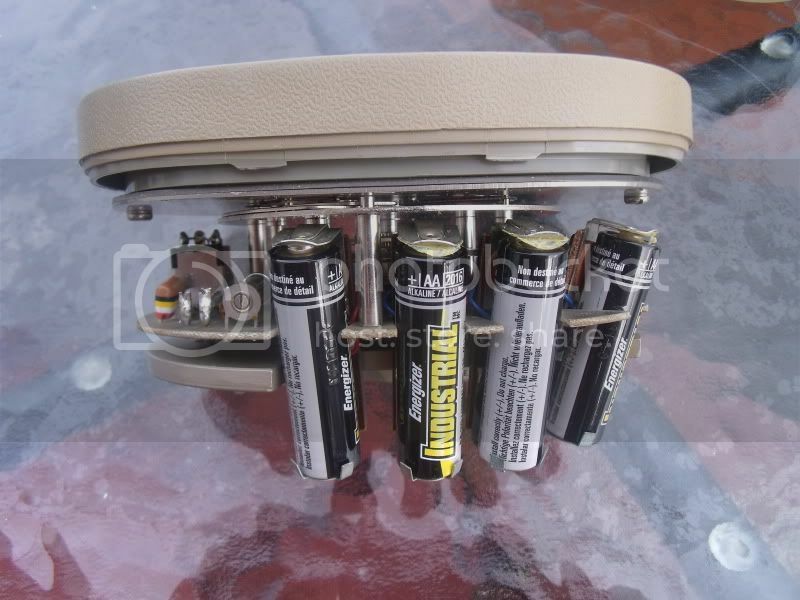 Looks like it needs more than batteries. Keith, yep this is the second one I have seen to come out of France, they usually only come form Germany and France, never seen one come out of anywhere else. I remember when you got sniped on the last one, real shame! This one will be going no where quick, thats for sure! Such a great piece of kit! Ah so you're the one who convinced that French guy to end the auction early! I was tracking it and all of a sudden it was gone...I thought maybe he'd had to stop the auction (he had mentioned something had come unglued) and was going to relist...he did get back saying he'd taken an offer (how does that work, the seller adds a BIN option? )...good price too...for the buyer, apparently he needed the cash for an upcoming vacation. I like this a lot, really cool. Very nice indeed, a great find Tom. 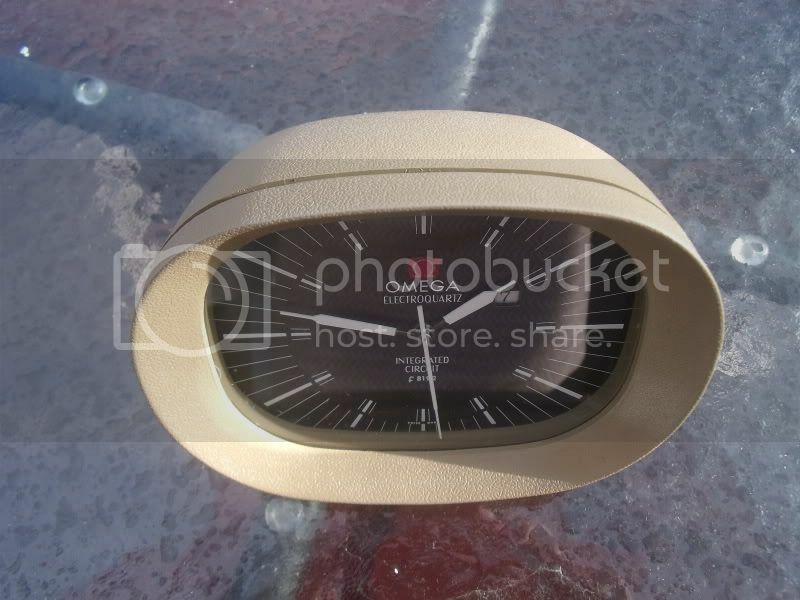 :D I think it looks cool, design is very of its time but it looks good to me, as a piece of the history of the development of quartz timing its got to be really special. Stunning! Love these. 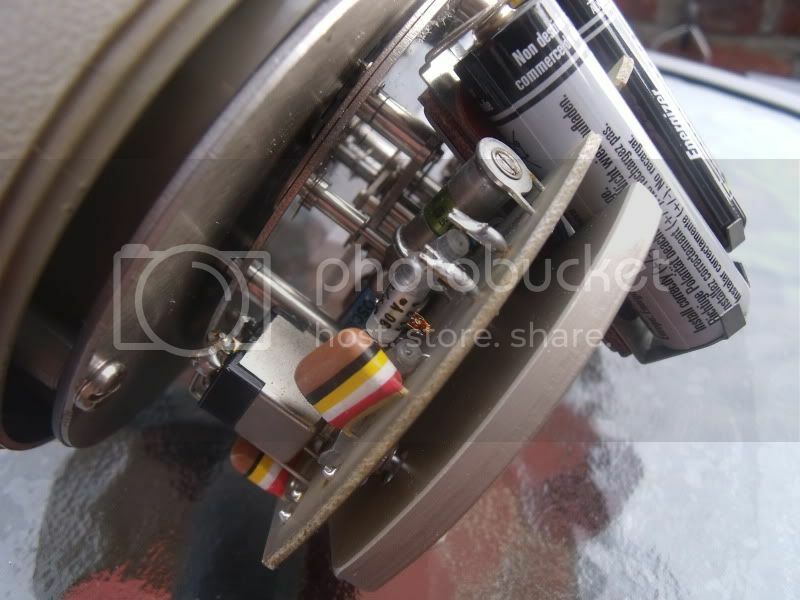 Yes I had an old Derby Swissonic which was fine but i found it too noisy, hows the Omega for noise Tom? Does the seconds hand jump in 1 second increments, or glide smoothly as the Beta 21 Electroquartz? Still kick myself for selling mine...my wife was most annoyed...she liked the tick or tock..said it was friendly. Yes, crazy price, you did get a good deal on yours though ;-) How has its accuracy been? Did we ever figure out what kind of quartz it was using, a 2.4 mhz maybe? Thanks Tom for introducing me to this rarity. But then Webvan finds another, just like London buses.....! 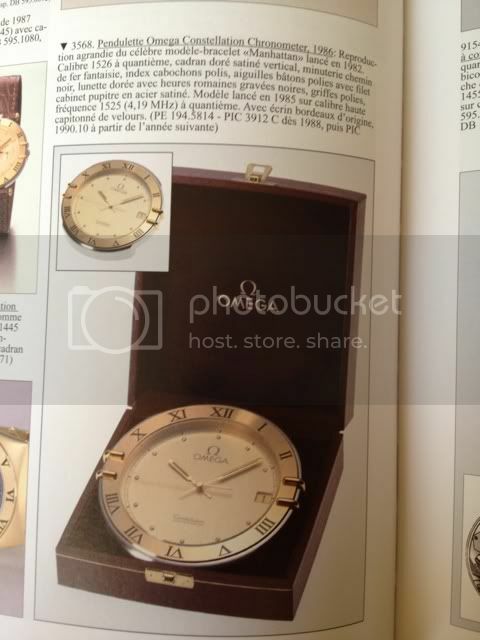 Was searching for some Omega calibre references and came across this page and found that this "Electroquartz f8192hz" clock uses Calibre 1390. 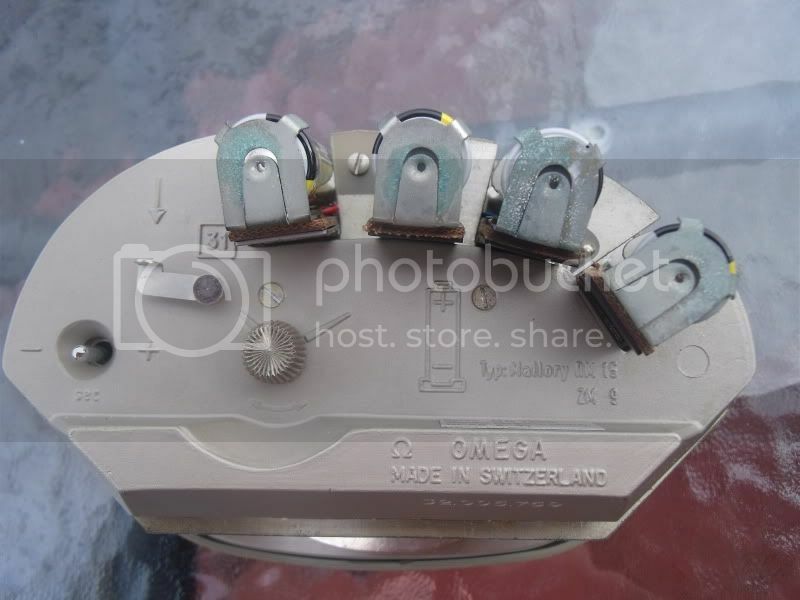 Also of interest on that page is the "Calibre 1526", a 4.19Mhz apparently used in 1986 for another desk clock...never seen one and Google either, that's unusual ! As a side note, Omega's other 4.19Mhz quartz, Calibre 1525, was used in the Marine Chronometer built for the French Navy. Cool looking clock I want one of those. There's a '2001 Space Odyssey' (which is the right date) feel to the design. On a serious note, unlike in a mechanical mov, in a quartz such as this, there is absolutelely no stress on the pivots so you will only need to clean and re-oil the mechanical elements and you are to back-to-as-new condition. One of the coolest items I have seen on here for a while. Holy smokes, that is super cool. I'm imagining that on my desk right now. Absolutely pleased that my 50th post should be a comment on that. 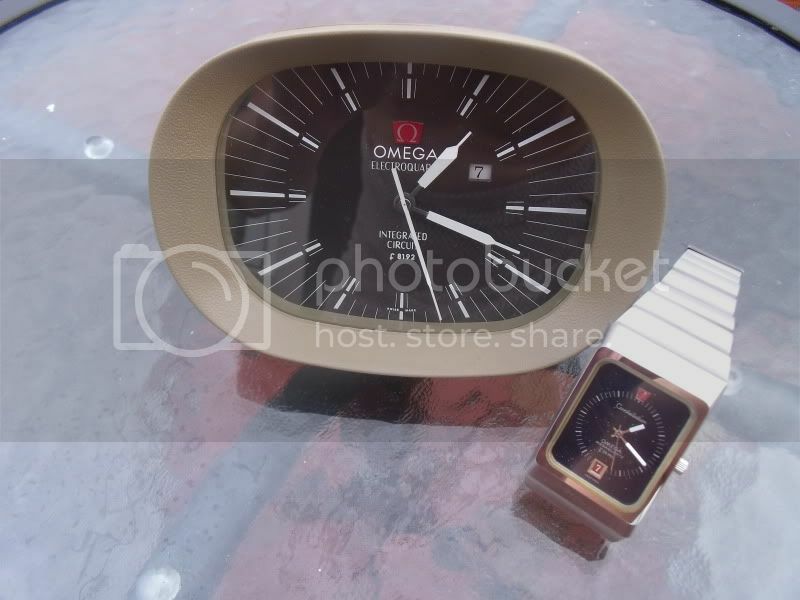 I love Omega's. So that's the version with the black dial and the previous owner took it upon himself to paint the case in black as the original grey color had apparently not aged well...guess it's always better to keep clocks/watches the way they were designed but I must say it works rather well. Last edited by webvan; 23rd January 2013 at 15:53. That really is a stunner. Well done fella. A great benefit of electricity instead of braked spring tension driving the hands. Awesome catch mate, where on earth did you find that beauty??? STS have two I believe, there was this guy in Spain asking €3000 for his, I know of another one, Bienne must have a few I'm sure. Last edited by webvan; 24th January 2013 at 00:35. Indeed STS do have two, both supplied by me, really cool clocks!